Never again will I think of cauliflower as that boring off-white vegetable often accompanied by a white sauce. Not that I didn’t enjoy it as such, but over the past months I have come to realize what a versatile vegetable cauliflower really is, and how quick and easy most recipes using it are. Cauliflower can be roasted, boiled, fried, steamed, pickled, or eaten raw. Some of my favourite recipes are cauliflower rice, cauliflower pizza bases and whole roasted cauliflower. However, the latest recipe I have tried out is probably going to be on top of the list and cooked fairly often – Parmesan Crusted Cauliflower Steaks. Remove all the leaves from the cauliflower, keeping the head intact. Carefully slice thick steaks from the cauliflower cutting from the top of the cauliflower down through the stem. Melt the butter with the garlic in a saucepan and pour it into a large baking tray (one which will hold the slices in a single layer). Sprinkle in the parmesan cheese and then season well with salt and pepper. 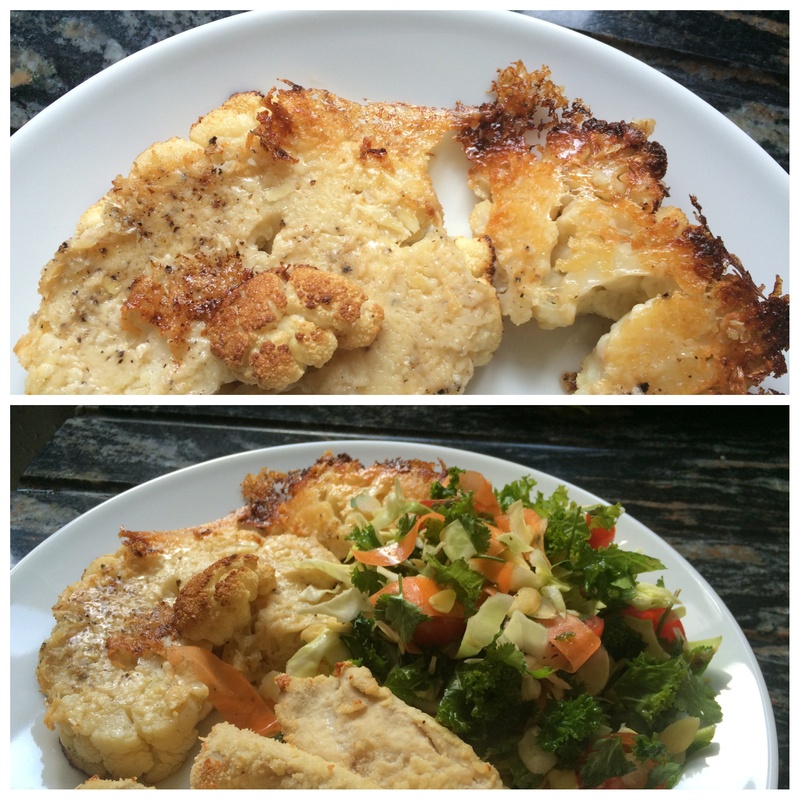 Lay the cauliflower steaks on top of the butter/parmesan and season them again with salt and pepper. Drizzle over some olive oil. 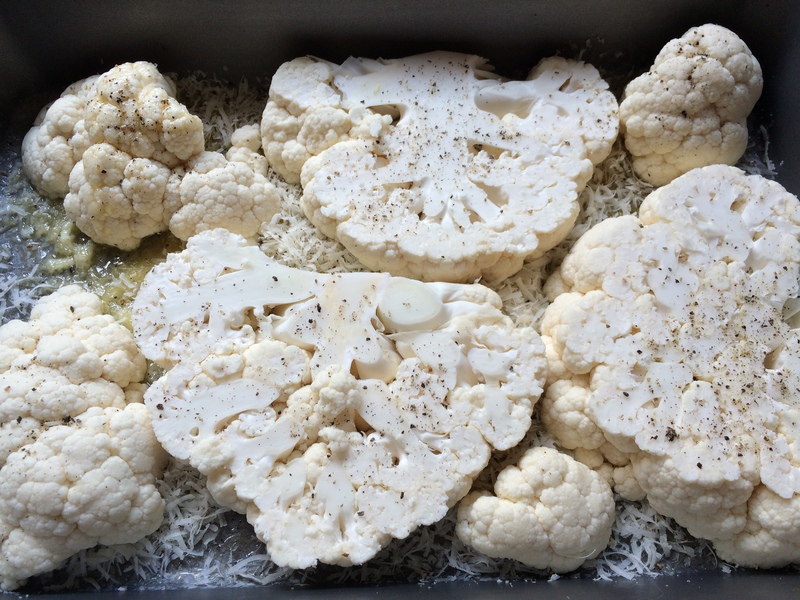 Bake in a 200°C oven for approximately 45 minutes or until the cauliflower is tender. Allow the cooked cauliflower to rest for a few minutes before serving as this will ensure the cheese crust sticks to it. I served my ‘steaks’ with a tasty Kale salad and some chicken fillets. They made a delicious alternative to potato. As an alternative to Parmesan, these steaks could be flavoured with balsamic vinegar or lemon. Some ideas to try out in the future. This entry was posted in Dinner, Lunch, Vegetarian and tagged Cauliflower, Gluten Free, Healthy Eating, Lunch, Parmesan, Vegetarian, Wheat-Free. Bookmark the permalink.